Congrats to DENNY144 for winning the Tradition contest! I love that you are starting a new tradition in your family to help accomodate the needs of sharing your kids with their in-laws. I think it really shows the spirit of the season, and hope that everyone will take a page from your book and know that the holidays are the holidays because we are together, not because of some accident of the calendar. Anytime we can gather to celebrate together it is a holiday! 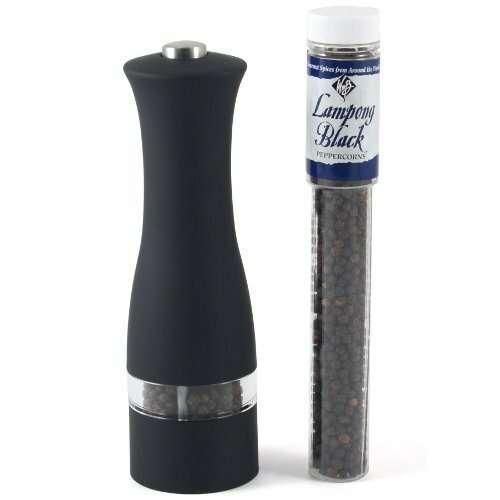 DENNY144, please e-mail me with your address at staceyballisinfo (at) gmail (dot) com and I will send you out your fabulous William Bounds Electric Peppermill ASAP. Don't forget, if you buy any of my books as a gift for yourself or anyone, you can e-mail me the receipt and your address and I will do a personalized bookplate sticker so that you can give the gift of autographed books! Get me those receipts to staceyballisinfo (at) gmail (dot) com by Dec. 15 and you'll have your shiny sticker in time for the holidays. Anyone else in need of a new side dish? At this time of year, there is no shortage of casseroles, stuffings and dressings, roasted root veg and endless potatoes. But at the fifth holiday buffet, don't you wish there was something a little new? A little sparkly? Your Polymath to the rescue! I love this rice dish. 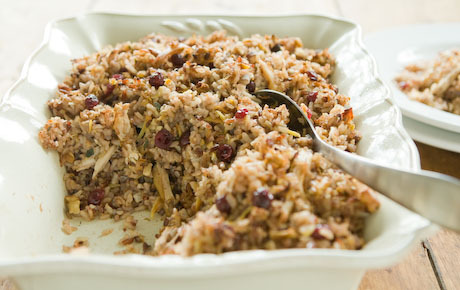 The wild rice mix is toothsome and flavorful. The pistachios add crunch and subtle richness. The dried currants are a welcome break from endless dried cranberries. And the fresh mint makes everything pop with vegetal freshness. Travels easily for pot luck parties, or is just a lovely new partner for your regular Tuesday dinner. Excellent hot, or at room temp, just don't do it cold or the butter goes all squidgy in a greasy way. Cook rice in rice cooker or according to package directions. Heat wine (whatever you have, red or white even sherry) and currants until currants plump, about 4-5 minutes, and discard liquid. Mix cooked rice with melted butter, pistachios, currants and mint with two large forks (a spoon will break up grains and make the pilaf mushy). Season to taste with salt and pepper. Some other good combos: walnuts and chopped figs, pine nuts and dried cherries, pecans and golden raisins, hazelnuts and chopped dates. If you hate mint, you can swap it out for flat leaf parsley, but I think the mint makes it. Chives are also good. This sounds delish, it makes me think of a Persian Brown Rice dish I make with olive oil, fresh lemon, cinnamon, cilantro, and cashews. Always a hit at parties. Most of your recipes sound WONDERFUL!! Anything that is Celiac friendly for the holidays? Andrea- unless i miss my guess, this one is celiac friendly, no? If you are looking for something specific let me know. Also, since they are much better equipped, scoot over to Gluten-Free Girl and the Chef blog http://glutenfreegirl.blogspot.com they have great stuff!